God Bless Rose Levy Beranbaum. I mean, REALLY. God Bless Her. Rose is the kind of woman that can take a distinctly non-domesticated female, give her clear and concise directions, and “wha-la” a masterpiece emerges! In case you don’t know about Rose, she’s the author of many fine cookbooks – and today I’m referring most especially to her authorship of The Pie and Pastry Bible. You see, a couple of years ago, I moved to the Monterey Peninsula and got an invitation to a certain someone’s locally famous Pie Party. That’s right. A whole party dedicated to pies. Notable judges are brought in. Everyone brings THEIR BEST effort. Votes are cast. Winners are crowned. It’s quite a deal. The first year that I attended, I relied on Rose to help me and she came through amazingly. I tried her Honey Chiffon Tart – co-produced with my friend, Pam. Can you believe we took second with this beautiful specimen? THAT gives you an idea of just how awesome the pies are at said Pie Party. Once again, I relied on Rose to help me out. She had published a recipe for a Mango Passion Tart, which I thought sounded fresh & lovely. The problem was that I couldn’t find passion fruit. So…I relied upon a similar tropical flavor to fit the bill, cherimoya. The white flesh is incredibly flavorful, bursting with tropical goodness. The cherimoya was juiced and then the juice was used to infuse the curd cream inside the tart. 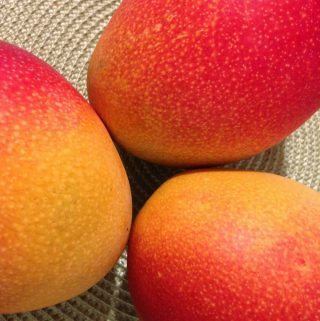 I wish I would have taken more pics along the way, but I just wanted to show you how amazing mangoes can be in pies & tarts. The tart turned out so beautifully! Not only was it pleasing to the eye, but it was light and fresh – and not too sweet. Everyone loved it – especially my husband. His birthday is coming up soon…I think I’ll make him one as a surprise! 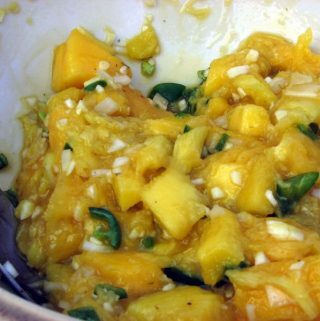 Mango Recipe: Mango Banana Rum Muffins – A Mango Recipe You DON’T want to miss.